RENOVATED EXCELLENCE WITH REMARKABLE BAY VIEWS! Showcasing characteristic design, style and status, this fully renovated four bedroom home flawlessly combines distinctive retro architecture with an inspired contemporary rejuvenation on 627sqm approx. of prime Oliver's Hill land. Bathed in natural light from every angle, this triple-level home provides a beachside address and lavish lifestyle that the entire family will enjoy. A spacious polished concrete entry provides a wet room/storage for unpacking from the nearby beach, before heading up the grand staircase to the vast open-plan living and dining rooms. Crisp white walls, polished concrete flooring and soaring ceilings compliment the flawlessly finished, stone-topped Bosch kitchen, cleverly appointed with a butlers pantry/combined laundry and huge island bench with breakfast bar. Floor to ceiling glass windows and sliding door receives the seamless addition of the alfresco dining showcasing the entertaining design of the home, including an adjacent balcony facing north where you can enjoy your morning cup of coffee and paper in peace. Easily imagine the countless summer days and nights spent by the large salt-chlorinated swimming pool while the kids splash around, with a lawn area and immaculate gardens providing a beautiful, private surround. Generous accommodation provides three large and versatile bedrooms each with built in robes, serviced by a contemporary main bathroom with a separate powder room. The oversized, privately set master retreat enjoys a walk-in robe/dressing room and stylish ensuite behind double doors exuding luxury. A step up the light-filled timber staircase to the second level will stun, with a second open-plan living/dining area complete with kitchenette and hardwood flooring featuring spectacular, uninterrupted views across Port Phillip Bay, the city, Dandenong Ranges and beyond. A vast balcony with room to entertain provides the full outlook across the Bay and a north-eastern aspect as well as cafe' awning for all-year-round enjoyment. 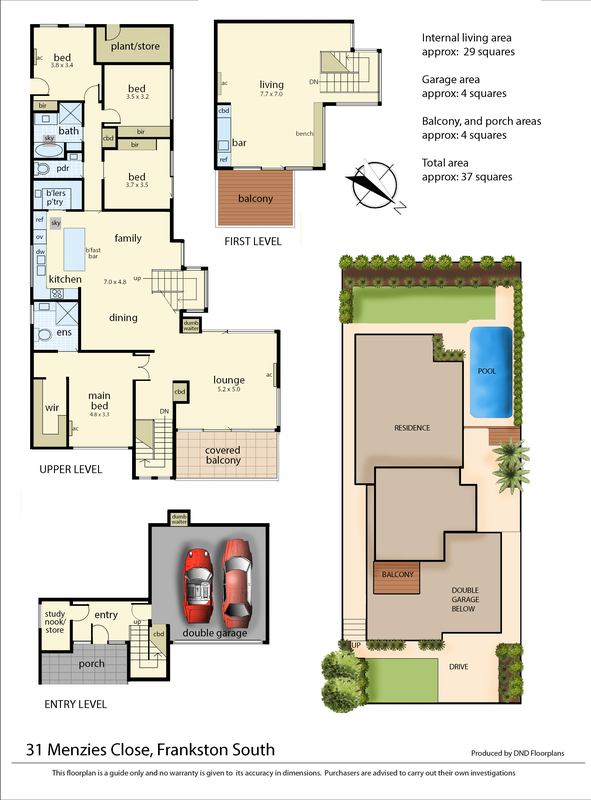 Comprehensive features include newly installed ducted heating and cooling with additional split systems, ample storage, new plush carpet, solar power and solar heating to the pool, pebblecrete driveway and remote double lock-up garage with internal access and retro dumbwaiter/lift for easy grocery delivery from the car. You couldn't wish for a better address! 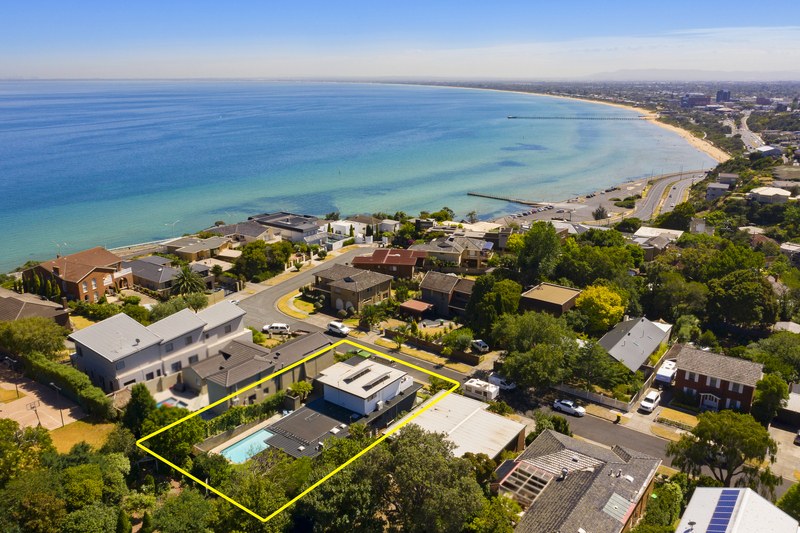 Ideally positioned on the revered Oliver's Hill, with a brief walk to Frankston City, trains and buses, an extensive range of the Peninsula's finest schools, the local beach and boat ramp and the ever popular Sweetwater Creek walking trails.